The attempted collective punishment of all Israelis, including and especially the most creative, will do nothing to build peace and much to bolster Bibi Netanyahu. LONDON — Today, I joined J.K. Rowling, Simon Schama, Tom Holland and many others in signing a letter published in The Guardian against a growing authoritarian trend to Boycott, Divest and Sanction (BDS) the state of Israel. This trend is spearheaded in part by a global alliance of those on the Regressive-Left and Islamists on campuses across the West. Supported beyond these groups too, BDS is part of a wider contemporary campus trend to simply… silence dissent. I have always supported the Palestinian people in their quest for self-determination. My disagreement—which is too soft a word for it—with Netanyahu’s policies and political opportunism is unrelenting. My frustration at the stubbornness of fanatical Jewish settlers, who put Israeli lives at risk with their intransigence and humiliate Palestinians by their mere presence, is palpable. But these are exactly the reasons why I oppose this simplistic, collectively punishing, censorious, and intellectually dishonest BDS movement. Netanyahu and his Likud party are only winning elections because Israelis are scared, and Netanyahu is doing his part to scare them beyond reason, so as to keep winning. Any attempt to isolate Israelis, make them feel even more besieged and surrounded than they already feel, will only feed Netanyahu’s vote bank further. He keeps winning because he’s telling Israelis that the world is against them. And BDS is doing everything it can to convince Israelis that, yes, the world is indeed against them. But Israelis are not Netanyahu. And just as I would argue for Palestinians during past crises in Gaza, likewise, Israelis are not collectively responsible for the mistakes of their government. 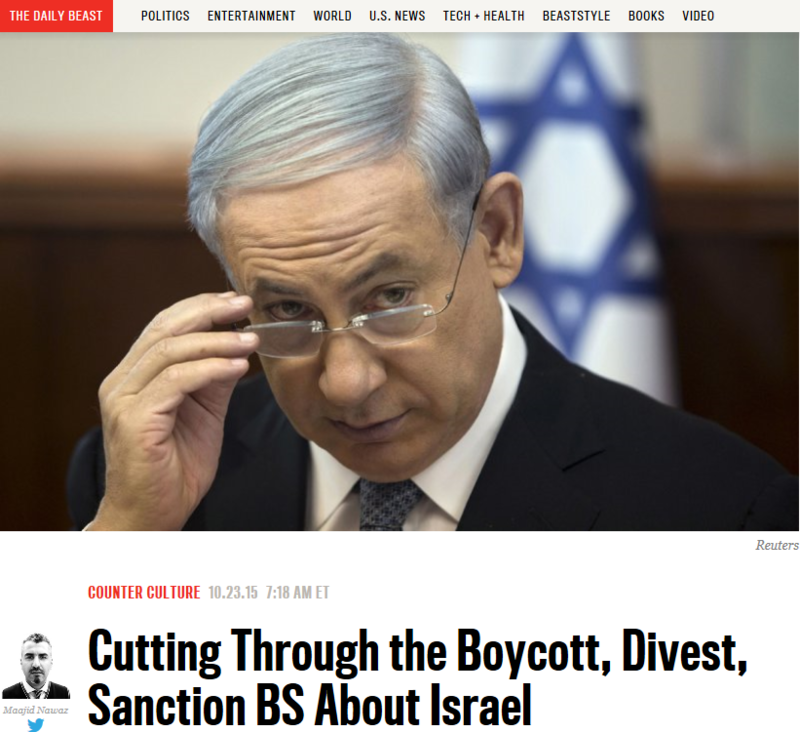 BDS, on the contrary, seeks to hold Israelis collectively responsible. BDS punishes an entire people, due to the actions of a government that only came to power because of the quirks of a proportionally representative (PR) system that allows for minority religious parties to exert undue influence over policy. As a result of Israel’s PR system, Netanyahu is only able to secure victory by forming a coalition with Naftali Bennett’s far-right, pro-settler Jewish Home. Free speech, artistic creativity and cultural expression are usually the first casualties of any societal trend towards authoritarianism. Whether it be ancient Buddha statues in Afghanistan, books in Timbuktu, or the ruins of Palmyra in Syria, what each of these examples demonstrates is the base fear authoritarians harbor towards culture. Culture questions and subverts. Authoritarians dictate and enforce. Culture seeks to remove barriers, thus breaking down fear. Authoritarians survive only by reinforcing those barriers. Though clearly in less extreme ways, BDS also targets culture. And by boycotting Israeli arts and culture, which is usually the domain of left-leaning Israeli Jewish and Arab opponents of Netanyahu, BDS handicaps Netanyahu’s liberal secular opposition, further securing his hold. No, I stand with Palestinian and Israeli peace activists, such as One Voice, who work on both sides of the conflict to eradicate fear. I stand with the Israeli Left and Israeli Arabs, who express their own disdain for Netanyahu’s policies through their creative projects, and their internal democratic dissent, in an attempt to subtly influence Israeli and Palestinian hearts and minds through culture. I stand with those proud Palestinians I visited in the newly built development of Rawabi in the West Bank, who partnered with Israeli—yes, Israeli—industrial expertise and Arab funds, in order to create an entire city from nothing. BDS would have us end all of this, leading to a climate of closure and suspicion. Only the extremists can win in such a climate, and this is what I fear is happening on campuses across the West. The intellectually lazy often resort to silencing dissent in the name of righteous indignation. But the real danger is in the intellectually dishonest. You see, The Lazy do not have the capacity to defend their censoriousness, and frequently resort to bullying in order to enforce their writ. This usually ends up with The Lazy destroying each other in their never ending quest to find the True Scotsman. The Dishonest, on the other hand, are like vultures. They will feed off the corpse of a dead argument not because they believe it to provide sustenance, but merely for the pleasure of excreting the waste on you. It is now not uncommon on Western university campuses to witness absurdities such as student groups refusing to condemn ISIS or proudly partnering with pro-Islamist groups such as CAGE all the while calling for the entire people of Israel to be boycotted. No doubt, many of these same student groups would support Obama’s deal to lift sanctions on Hezbollah-terrorist-supporting, Assad-backing, theocratic Iran, while simultaneously calling for sanctions to be imposed on Israel, a democracy—albeit an imperfect one. In this latter case, it should be remembered that Iranian film has done wonders breaking down barriers and critiquing internal oppression, because Iranian cultural exchange was exempt from U.S.-imposed sanctions. Consistency would be to continue encouraging more such openness, but the incredibly regressive step seeking to ban Israeli films achieves the exact opposite. As a British author I would be mortified if my work were censored or affected in any way around the world due to the actions of my government—such as the invasion of Iraq, which incidentally I have always opposed—or due to a political position taken by any other fellow British writer. Indeed, how would Turkish authors feel if they were held responsible for their government’s perceived approach towards the Kurds? Policies that impose collective responsibility, especially on the artistic and creative communities who usually challenge the status quo within their own cultures, must be resisted across the board. At this point, an argument usually proffered by The Lazy and The Dishonest, is that BDS worked against Apartheid, and Israel is no different, so why not? What is the true drive and motivation behind the Israel Boycott Movement?